This February, weâ€™ve been witness to the launch of Ultra HD Blu-ray, probably the penultimate optical carrier for video, in the consumer market at least. Itâ€™s been three years in the making. Why has it taken this long, and is it still on time or coming too late? Ultra HD Blu-ray is the youngest branch on a tree of optical video discs thatâ€™s almost half a century old by now. In 1969, Philips Electronics started R&D work on optical discs for video. In 1974 the first prototype was ready for public demonstration; in 1978 the product was launched as â€˜LaserVisionâ€™. These 12-inch/30-cm discs, the same size as vinyl LPs but shiny like the later CDs, could hold analog video and audio. Although superior to consumer videotape, the read-only format could not win over consumers like recordable videocassettes did. Compact Disc Digital Audio, the wildly successful 12-cm disc launched in 1981, was derived from these LaserVision discs. A new version of the large videodisc called LaserDisc was introduced in 1986, this time with digital audio, the same like with the â€˜Red Bookâ€™ CD-DA format i.e. PCM-encoded sound. In Europe, this format was branded â€˜CD-Videoâ€™. This format spawned a hybrid variant that measured 12cm and combined 20 minutes of CD-compatible digital audio with up to 5 minutes of analog video playable on LaserDisc players. LaserDisc never became a mass consumer product. It reached about 1% market penetration â€“ a niche, but one that sustained itself for years. Cinephile movie collectors built up impressive collections of hundreds of titles. These discs were not cheap â€“ they could easily cost upwards of $80 â€“ but the movie studios catered to their tastes with widescreen editions (at a time when VHS releases were almost exclusively pan-scan in 4:3 aspect ratio) and bonus features. LaserDiscs were also the first consumer media to feature 'AC-3' surround sound, later rebranded 'Dolby Digital'. In Asia, LaserDiscs became popular media for karaoke. Philips, Sony and other manufacturers offered various players but Pioneer was so successful with this product that many erroneously attribute the LaserDisc format to this company. By 1993, MPEG digital video compression (combined with digital audio compression) had made it possible to squeeze video+audio into the same amount of bits that could previously only hold audio: The new Video-CD format, derived from Philipsâ€™ interactive CD-i standard, could hold up to 80 minutes of MPEG1 video. Although the actual resolution was only one quarter of what we now call SD (Standard Definition), this was a breakthrough heralded as â€˜Full Motion Videoâ€™. Not long after that, improved video compression (MPEG2) but especially enhanced optical disc technology (4.7 GB on a single-layer disc, compared to about 700MB on a CD) made it possible to put feature-length movies in excellent SD quality on 12-cm discs. A brief â€˜format warâ€™ between Sony/Philipsâ€™ MMCD and Panasonic/Toshibaâ€™s Super Density Disc was resolved before either format reached the market and the DVD-Video standard became a runaway success for both rental and sell-through â€“ much like the audio CD did some 15 years earlier. By the late nineties, television was transitioning from Standard Definition SDTV to High-Definition HDTV. The DVD format was not suited for this so Blu-ray Disc was conceived. Blu-ray Disc (BD) had most CE manufacturers including Sony, Philips, Panasonic and Pioneer behind it but in the market it had to compete with Toshibaâ€™s HD-DVD format. Toshiba had a powerful ally in Warner Bros. but once Warner threw its weight behind Blu-ray Disc the format war was over very soon. By January 2013, â€˜4Kâ€™ Ultra HD was already a big item at CES. Andy Parsons, President of the Blu-ray Disc Association, confirmed a working group of the BDA had started looking into extending the BD spec to UHD three months prior. By NAB 2013 (late April), the task force says itâ€™s evaluating proposals and planning to take a decision by the end of that year, although it soon becomes apparent that itâ€™s not going to be 2013. Discussion items include the question whether or not the new format should be backwards compatible with existing Blu-ray Disc players. No news at IFA or CEDIA that year. One year later, by the time of the January 2014 CES, the BDA says the new format is on the way or at least under consideration. An optimistic Samsung spokesperson suggests Blu-ray Discs with 100-125 GB capacity are likely to be available that year. At the September 2014 IFA, the message is the specs are to be finalized by summer 2015, with discs and players to follow by the end of that year. At the January 2015 CES, Panasonic shows its prototype Ultra HD Blu-ray player for the yet to be agreed on new standard. The standard gets an official name, and discs are expected to be produced by that yearâ€™s holiday season. In September, at IFA, Samsung shows its prototype player and 20th Century Fox commits to releasing titles in the new format but it becomes clear that discs and players will not make it to the market that year but â€œearly 2016â€�. That prediction eventually turns out accurate and Friday February 5th the first players are shipped â€“ one month ahead of predictions made at CES 2016, where a number of other studios including Sony Pictures, Warner Home Video Entertainment and Shout Factory committed to issuing titles. Why did it take more than three years from the first conception to actual launch, meanwhile the rising popularity of video streaming has been steadily eroding the market for physical media like DVD and Blu-ray Disc? Probably a number of factors. It would have been possible to put Ultra HD movies on existing 50GB BD-ROM discs â€“ Sonyâ€™s first-generation â€˜4Kâ€™ media player, the FMP-X1, stored feature films at an average size of 38GB using the less efficient H.264 compression. Probably the BDA members realized though that however tempting it may be to come up with a quick fix in order to start competing head-on with streaming as soon as possible, this would likely be a losing proposition. Instead, theyâ€™ve chosen to compete on picture quality with specifications that will be superior for years to come. Decent quality video streaming at HD resolution has become widely available lately, thanks to SVoD services like Netflix. Itâ€™s tempting to think Ultra HD streaming is within reach but for most people, even in developed markets. Netflix recommends at least 25 Mbps average sustained bandwidth for UHD streaming, and it â€˜should workâ€™ at 15 Mbps. This is out of reach for most UHDTV owners, as Dan Rayburn points out in this excellent analysis, backed up by data from sources like Akamaiâ€™s State of the Internet, which often gets misinterpreted but actually paints a bleak picture of the state of â€˜4K-readinessâ€™. Sure, Adaptive Bit Rate (ABR) technology used in over-the-top streaming enables flexible compression when bandwidth is constrained but overly compressed UHD video defies the entire point of Ultra High Definition. The BDA has decided to forego compatibility of the new discs with legacy BD players. This makes authoring probably more straightforward, and bundling a 1080p Blu-ray Disc with an Ultra HD Blu-ray Disc seems like a pragmatic solution. The BDA has however decided to adopt a new physical disc standard. The characteristics of the laser and the optical pick-up mechanism are the same for Ultra HD Blu-ray as for regular BD. If they had opted for even shorter wavelength lasers (say violet or ultraviolet) development of the new standard and components required to read (and author) the discs would surely have taken even longer. As such, the transition from BD to Ultra HD Blu-ray is less drastic than the one from DVD to BD. The increased capacity of the disc layers and the increased number of layers however must have necessitated the development of new chipsets, which is a time-consuming process. What no doubt also contributed to the prolonged standardization effort was the decision to include Wide Color Gamut and (WCG) High Dynamic Range (as an option) in the standard. CE manufacturers will have come to realize that â€˜4Kâ€™ resolution alone may not be enough to sway most consumes, and HDR video is actually much more compelling, especially when used in combination with UHD.Â The problem, of course, was that there was no single agreed standard for HDR video yet but a number of technical proposals instead. See this piece on the state of HDR. In the end, the BDA has decided to make the HDR10 Media Profile the required standard for discs as well as players, with both Dolby Vision and Philipsâ€™ HDR format as optional extras. While inclusion of HDR has undoubtedly cost extra time it has made the Ultra HD Blu-ray format far better protected against quick obsolescence. 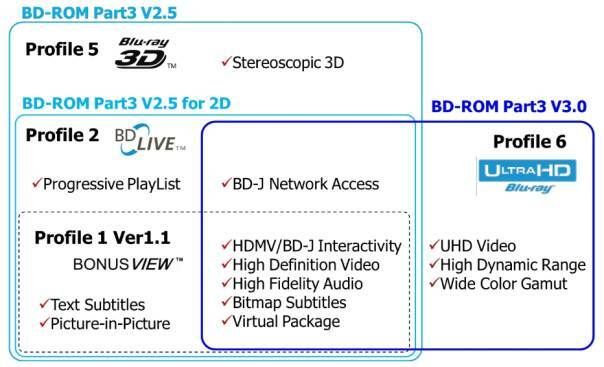 The BDA has decided to leave out certain elements of the Blu-ray Disc spec in the Ultra HD Blu-ray spec, supposedly to speed thing up; notably stereoscopic 3D but also some interactive features from the Bonus View and BD Live specifications. Ultra HD Blu-ray spec as per v3.0 of the BD-ROM Part 3 spec. Surely this has helped speed up testing of Ultra HD Blu-ray discs as well as players.Â Another area where this must have been beneficial is development or adaptation of authoring tools. Reportedly, the tools are familiar and mature, and discs created using these worked straight away without extensive debugging of discs and player software as was needed with previous launches of new standards. It is quite certain that there will be no new discs formats with even higher capacity beyond the new BD-ROM flavor that is Ultra HD Blu-ray. Optical Disc technology is definitely in the late stages of its life cycle.Â DVD has managed to eradicate VHS but Blu-ray Disc has not quite completely displaced DVD. BD is for sure a mass-market product but not with universal consumer adoption. Ultra HD Blu-ray will likely be much more of a niche product. That is not necessarily a problem â€“ LaserDisc has been a successful niche product for years. In high-end audio, the Super Audio CD (SACD) format has carved out its niche already for well over a decade. So how to distribute â€˜8Kâ€™ video (7680Ã—4320, officially called UHD-2) in the future? Itâ€™s still a few years out (think beyond 2020) but itâ€™s on the horizon. The bandwidth needs will be massive. The spatial resolution requires four times the bandwidth of â€˜4Kâ€™ UHD-1. In order to avoid motion blur, which becomes much more serious at higher resolutions, one needs at least 120 fps frame rates, requiring about 50% high bitrate than 60 fps, so 90-120 Mbps seems a reasonable estimate. General broadband infrastructure will not be able to deliver such performance any time soon. Of course there are flash memory cards and iVDR removable hard disk cartridges but not such media but while such media could be used for downloading movies theyâ€™re just too expensive (even at extrapolated future prices) for movie distribution, with the massive capacities required. Looking closely at the Ultra HD Blu-ray specs however, it turns out that the disc format is already suited for such data-intensive applications. There may be a challenge with respect to the playing time for 8k120p video but advancements in compression technology may be able to solve that issue in time. Such a new codec (H.266?) will require a change of the data level standard for Ultra HD Blu-ray, but not the physical format, making such a future update much more feasible. Ultra HD Blu-ray players and discs are available for purchase now. The standard is future-proof with features like Wide Color Gamut and HDR10 plus options including Dolby Vision, enabling true Ultra HD video delivery at a quality that streaming will not be able to provide for a while in most developed markets. Fortunately, there is no format battle with competing disc standards this time. Hereâ€™s to hoping it will be a resounding success. Yoeri Geutskens has worked in consumer electronics for more than 15 years. He writes about high-resolution audio and video. You can find his blog about Ultra HD Blu-ray at @UltraHDBluray. Â© 2016 Yoeri Geutskens. All rights reserved.